White nationalist’s harassment led a black female lawmaker to resign. He won’t face charges. 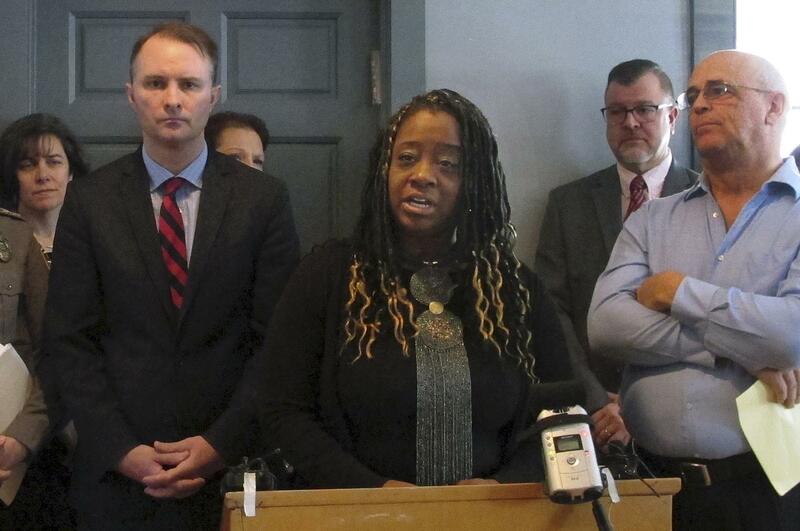 Tue., Jan. 15, 2019, 8:47 a.m.
Kiah Morris was standing next to Vermont Attorney General T.J. Donovan at a news conference on Monday in Bennington, Vermont, taking questions from reporters about the racial harassment she endured for two years as the state’s only black female representative, when suddenly she stopped talking. She took a breath and then grimaced as everyone turned to find a man in a black shirt emblazoned with Pepe the Frog – an adopted meme for the alt-right – standing in the back of the church. The whole room seemed to recognize him. Some let out an audible gasp. Morris backed away. The man was Max Misch, according to the Burlington Free Press, which along with other local news outlets identified the Bennington resident as a self-described white nationalist. The news conference, to some degree, had a lot to do with him. The online messages Misch sent to Morris over a two-year period starting in 2016 were included in a months-long state investigation into the racial harassment the Democrat experienced, although Donovan announced Monday he could not file charges. Misch had disrupted Morris’s life to the point that she sought, and was granted, a one-year protective order against him in 2016. He and others had disrupted her career such that Morris abruptly resigned in September, citing the racial harassment and threats, shocking the Vermont political community. To Misch, the whole incident was little more than a joke, as he told the Free Press afterward. “I like trolling people – it’s fun,” he said. But to the audience, his interruption appeared to encapsulate everything Donovan said the news conference was about: how, in an overwhelmingly white state, should Vermonters confront the type of racial harassment potent enough to push its only black female representative out of the legislature? On Monday, Donovan released a 10-page report documenting the racially charged messages Morris and her husband received from Misch and others, and all the times they called 911 at the sight of unknown vehicles or people lurking outside their home. The details of the report showed a family living in constant fear and suspicion. “Go back to Africa, it’s the only place you’ll ever be safe,” one message said, according to Donovan’s report. “Kiah Morris hard at work destroying White Vermont,” another said. One message from Misch was a tweet including an offensive caricature of a black person and a vulgar message that read in part, “I be representin dem white m—f——-z of Bennington,” and which tagged Morris. But Donovan said that while the racial harassment was disturbing, it did not rise to the level of criminal charges because of free speech protections. Donovan said Morris’ car and home had also been burglarized and that items had been stolen, but there was not enough physical evidence to identify any suspects and bring charges for those offenses either. Though Morris and her husband believed the incidents were related to the online messages, the report does not note any definitive link. Morris, a 42-year-old racial and social justice advocate, said the harassment escalated from the time she won the Democratic primary for reelection in 2016 until her resignation last September. Swastikas appeared on trees along walking trails near her property, she said. Her car and her home were broken into, she reported to police. When she went to cast a vote at her polling place in November 2016, Misch was there staring at her, according to Donovan’s report. That’s when she decided to seek the restraining order, which a judge granted. But as soon as it expired a year later, Misch continued targeting her, according to the report. Once Morris resigned in September, one person wrote to her, “Thanks for resigning, now please move out of my state,” said her husband, James Lawton, who read the messages aloud at the news conference. Though Donovan could not file charges, he said that political and community leaders had spent the last several months brainstorming a new “bias incident reporting system,” seeking to documents all incidents of attacks on someone’s identity even if it did not amount to a crime. Misch’s interruption came toward the end of the news conference. He said he just wanted to tell his story, according to the Free Press. But his story would not be he heard over the shouting that erupted in the room. Some community members tried to literally cover him up, finding his Pepe the Frog shirt to be offensive, the Free Press reported. Some questioned why he was allowed to be there. Donovan tried to take control again but the audience was too distracted. One of Morris’s former political opponents, identified as Republican Kevin Hoyt by the Vermont alt-weekly Seven Days, tried to take the floor. He said, “I call bulls—- on Ms. Morris!” and the room only grew more tense. The crowd began booing him until Donovan yelled loudly enough to regain the floor and have the last word. Published: Jan. 15, 2019, 8:47 a.m.